JUST OUTSIDE THEgate called Beautiful which led into the temple sat a poor cripple who had never walked a step. From his babyhood he had always been a cripple, unable to move himself about. Now he was a grown man, forty years old, and every morning his friends carried him to the place where he lay just outside the Beautiful gate.Because this poor man could not walk, he begged for a living. His friends carried him to the temple gate, where many people entered each day to pray. 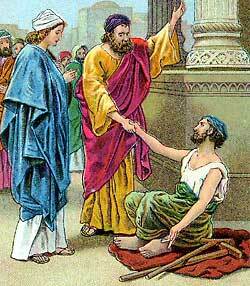 He believed that when these people saw him they would pity him and give him money. And they did. One afternoon Peter and John went up to the temple to pray. As they were about to enter the Beautiful gate, the crippled beggar saw them. He called them and asked for a gift of money, just as he had begged from every other passer-by. The two apostles stopped and turned to look for him. And the cripple looked up, expecting to receive at least a small coin. With these words Peter took the surprised man by his right hand and lifted him up, and at once strength came into the feet and ankles that had always been helpless. Then the man sprang up and walked and leaped about, praising God. With Peter and John he went into the temple, and there he rejoiced aloud. The people who saw him walking and leaping for joy were amazed, because they knew he was the same beggar who had asked them for money when they entered the gate. The happy man, wishing to express his great joy, then seized Peter and John, and while the three stood on Solomon’s porch the astonished people gathered round to look on them. He told them that the God of Abraham, of Isaac, and of Jacob, whom they called their forefathers, had glorified his Son Jesus, whom they had refused to believe. The listening people were made sad to think they had not believed in Jesus while he was with them. These and more words Peter spoke earnestly to the listening crowd and many of the people believed in Jesus and were saved. Soon the rulers of the temple, the chief priests, and other religious leaders who had caused Jesus to be put to death, heard about the healing of the lame man. And they heard Peter preaching to the wondering people who stood in the porch. For a while they listened, too, then they went away angry because Peter taught that Jesus had risen from the dead. They had paid the Roman soldiers much money to keep this marvelous thing secret and they were displeased to hear Peter and John boldly declare that God had raised up the man whom they had crucified. “This teaching must be stopped!” they cried, and in a little while they returned to take Peter and John off to prison. The rulers looked on, amazed; for they saw the man who had been crippled standing with Peter and John, his face beaming with joy. Not knowing just what to do, they dismissed the prisoners for a few moments and talked about the matter. They could not deny that a great miracle had taken place, and they marveled at the boldness of the apostles, who were unlearned men. They knew these apostles had been with Jesus, and they knew the same works Jesus did were being done by them. Although they had killed Jesus, now they saw they had not stopped his great work. Still they hoped to stop it, so they called the prisoners back and commanded them to teach no more in the name of Jesus. The rulers threatened to punish them severely if they should catch them any more teaching in Jesus’ name, and with such threats they let the men go free. And Peter and John returned to the company of believers, who were called disciples, to tell of all that had befallen them. Instead of complaining about this persecution, the disciples knelt down to pray. They talked to God, and told him how the wicked rulers who had killed Jesus were threatening to punish them if they continued to preach about his resurrection from the dead. They did not ask God to protect them from the wrath of these wicked men, but they asked for more boldness, that they might continue to declare to all men the power of God in Christ Jesus, his Son. They asked God to help them work more miracles in the name of Jesus, even though this one had brought them into prison. God was pleased with such a prayer. He caused the place where they were assembled to be shaken by his great power. And again the Holy Spirit came upon them, giving them more courage and boldness to preach the gospel. I JUST LIKE TO SAY THAT THIS TEACHING HAS TAUGHT ME TO BE BOLD AND COURAGES BEFORE HIS PEOPLE, STAND UP FOR WHAT IS RIGHT, AND NOT BE AFRAID OF WHAT PEOPLE MAY SAY, I KNOW THAT I WAS CHOSEN TO DO THE LORD’S WILL, I HAVE A BLOOD BOUGHT RIGHT TO TELL THE GOOD NEWS TO HIS PEOPLE WHO ARE DYING DAILY BECAUSE OF LACK OF KNOWLEDGE. We are all his children. Jesus Christ our lord and savior said we should Love all of our brothers and sisters. Yes we are in a sinners world, we sin and ask Christ our savior to forgive us. On the cross he gave his spiritual and flesh so we could be with him in his fathers house. We await his second coming when we will greet him when he returns.